Dynamics 365 for Retail contains core retail functionality that is typically used by most retailers. This tailored functionality improves productivity and helps to ease the on-boarding and training processes for your employees. 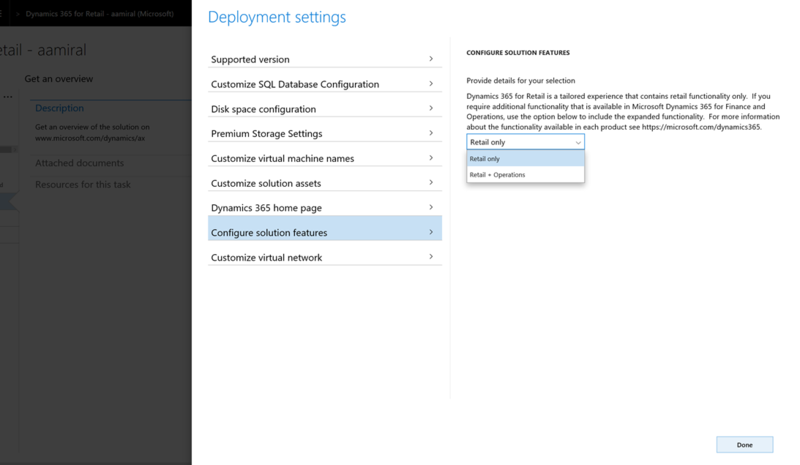 With Dynamics 365 for Retail, you also have the option to enable additional functionality. This means that you could deploy a Dynamics 365 for Retail environment that has the same functional footprint as a Dynamics 365 for Finance and Operations environment. The following table lists the key differences between Dynamics 365 for Retail and Dynamics 365 for Finance and Operations. * Can be configured after deployment. For more information about licensing, see the Licensing Guide. When you first visit Lifecycle Services (LCS) after acquiring the necessary licenses for your tenant, you will be prompted to choose an implementation project type, which is where you must select Dynamics 365 for Retail or Dynamics 365 for Finance and Operations. You can use the above considerations to choose the right product to deploy. If you want the solution scoped to retail functionality only, select Retail only. If you want to enable additional functionality, select Retail + Operations.